Today was 'toddler group' day. I try to get to one a week, and this one fits us just nicely. It is kind of how toddler groups were about 20 years ago. Well most of them still are, but this one has a particularly vintage feel ! In an old methodist church with parke (sp ?) flooring, old metal chairs with real wood seats, and lovely retired, apron wearing ladies who bring you a cup of tea and smile sweetly. I do like children's centres, but there is just something very comforting about an old skool toddler group don't you think? There is toast with lashings of cheap margarine spread over it, the usual toys plastic and wooden, all set out on a old dusty floor. It's all in one room instead of spread over 3, so sitting down is an option as you can see your little un at all times. 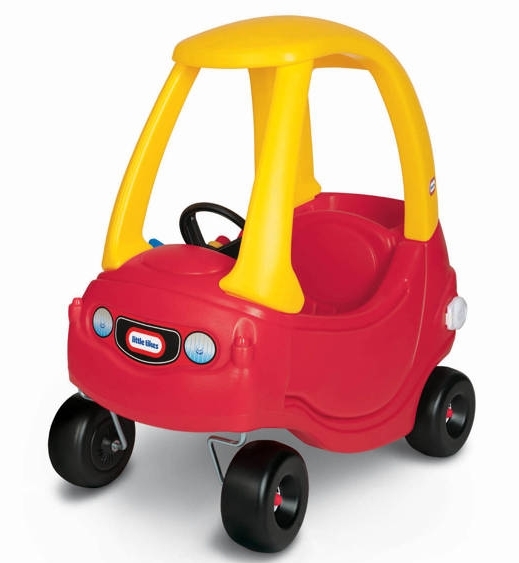 Whoever designed this little vehicle really knew what kids like. My Little tike is now safely tucked up for her lunchtime nap, while I rest my toddler group weary muscles. They bring you a cup of tea?? I'm there! Yes they really do. It is probably a bit dangerous with all the kids running around, but it's lovely to be looked after a bit !